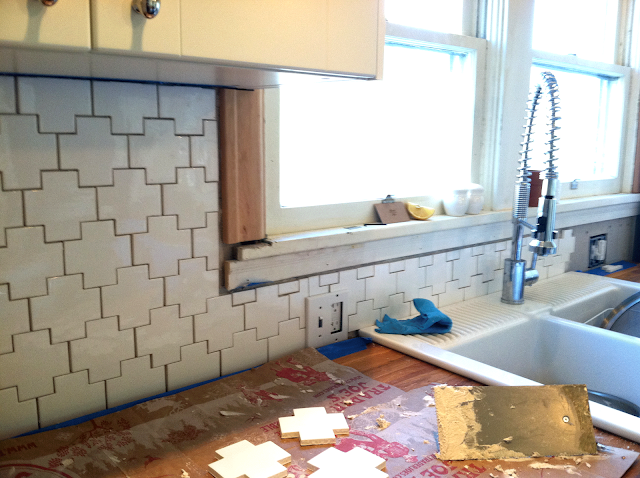 Well, if you follow me on Instagram (jennmccormick), you know that over the long weekend we tiled! Specifically, the kitchen backsplash! But along with tiling, we also got a few other major things done. On a very related note, we seriously have the most amazing friends. You know the friends that way-back-when helped us renovate our back entry and refinish our hardwoods? Those are the same friends that helped demo the kitchen and built our cabinets? Well they came over this weekend specifically to tile and do whatever else we still needed help with. I cannot even begin to tell you guys how grateful we are that they're in our lives -- and how much we'll owe them when they buy a house :). We have a backsplash! And oh does it change the look of the space! The tile is Ann Sacks Swiss Cross. I am so in love. Because it's such a small space, we wanted something that had personality, but was still neutral and classic. I think this fit the bill so well. 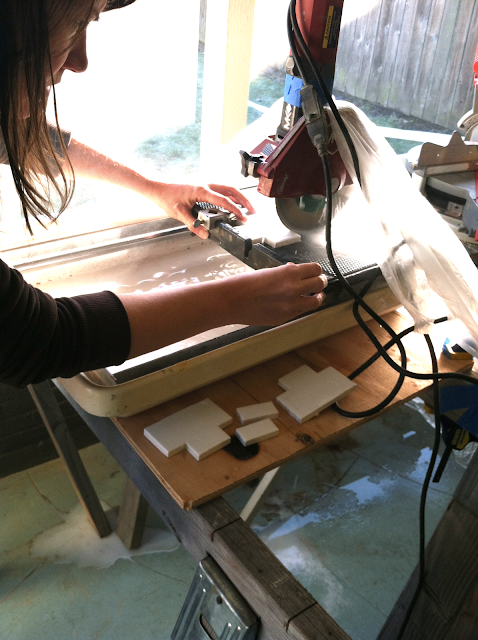 I didn't take a lot of photos of the process, because I was actually tiling! The girls tiled while the boys did other stuff. It was my first time tiling - and it was actually pretty easy. The hardest part was figuring out the pattern so we could begin. Up next will be grout - hopefully this weekend. But FIRST we need to decide on what color grout - white or gray. I am so torn! Any opinions, friends? ps. You can also see that we installed window trim after the last post about trim :). Much better! First, the counter top extension! We've been planning this since the beginning. We couldn't plan the island to be as long as we wanted - for clearance reasons - but, we really wanted it longer than the space logically allowed. Enter, the extension. It can go up when we need it, down when we have a lot of people over and need the space. We still need to install the piece that moves it up and down, so that's next. While the girls were tiling, the boys were adding the extension and gluing down the copper. Making sure it's a tight, solid fit :). Yep, there was a rolling pin involved. The boys also did some ducting work, which I'll show you later. But really, it isn't all that exciting, but is really nice to be getting done! And this guy? He was our supervisor for the day :). All in all, a very productive weekend. It's going to take me quite awhile to finish up and paint all the trim, but I'm getting so excited to share final photos with you guys! Wow, Jenn. Love the tile. Seriously it's going to look amazing...already does! Grout...man, that's always a tough one. Maybe a light gray grout would make the tile stand out a bit more?? I'm sure you have tons of inspiration pics with both color options...you really can't go wrong. Either way that tile is going to be the star of the show. Way to get a chunk of work done this weekend and YAY for friends helping!! I say gray grout to capture the rest of the grays in the room! That tile is. to. die. for!!! Seriously, a show stopper! But then all of the rest of the details are incredible as well. And YES, you two owe some major help to your friends, back in the day we referred to helping one another with our home projects as "Amish Days!" I love your backsplash! My initial though is gray grout just because I've always love the contrast with white tile. What about a color grout, like a dark navy? That could look sweet! So exciting!!! The extending counter is such a good idea. So, I know everyone is on this dark grout with white tile bandwagon, but I just can't get on board. I could list all the reasons I hate it, ha!, but I'll such say my vote is a resounding, white. Holy my goodness!! LOVE the backsplash! Great work! And those friends...yeah, I agree, they are pretty stinking amazing!! And grout? I'm boring...white. Unless it was a light gray...??? You already know how I feel about the tile - LOVE! And I vote gray grout:). I love that tile. It is SO you! It looks so good! Love the tile choice! Gorgeous, Jenn!!! This kitchen just keeps getting better and better every post you do on it!!! Looove the shape of the tile, it is just enough of a different spin to make it unique but still classic. Encouraging to hear that you guys did it your self too, with help;) I know nothing about grout..but I always thought too dark grout makes it look like its dirty all the time. And white might actually get dirty too easily. What about a soft light gray? Oh my! I am so totally smitten with your copper kitchen island! It's so gorgeous!